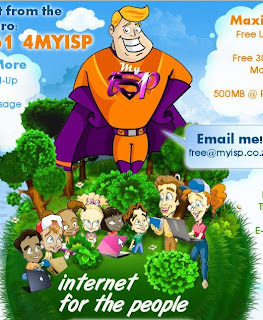 Interprise (Pty) Ltd, a South African internet company that has been around since 1999, has launched MYISP.co.za which is offering free dialup and perhaps more importantly, ADSL accounts. There are three account options tha offer between 200mb and 250mb ADSL account free. Depending on the account you choose, you can opt-in to pay R29-00 a month for a mailbox with top-ups available @ 10c a mB, R55 for 500mb and between R100 to R120 for 1Gb topups. ABSA have one fan page on Facebook with 2488 fans. 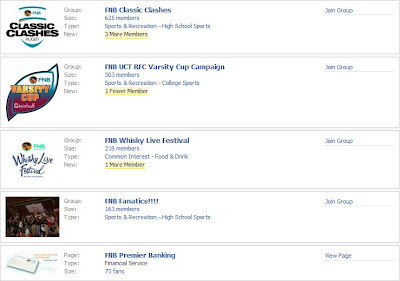 Although an ABSA fan page, this has been geared more around the Currie Cup than actual banking. It's heavily branded with Currie Cup information, photo's and videos of their Currie Cup TV commercials. However they do seem to respond to wall posts made by their customers, even posting a TV ad script when requested. FNB have one fan page aimed at the their Premier Bankers with 73 fans. Nedbank has no banking consumer orientated Facebook presence. They do have a page dedicated to the Nedbank Local Heroes, where you can nominate a worthy cause or person for a R10 000.00 prize. A touch I like is the videos they have included of the nominated heroes. 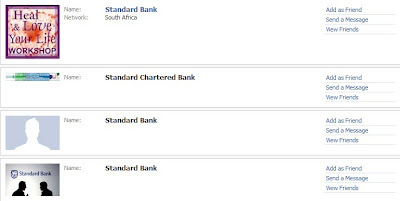 I couldn't find any evidence of Standard Bank having any official presence on Facebook other than someone who has setup up a persona with a Standard Bank logo. It would seem that ABSA has a clear lead when it comes to using Facebook to interact and communicate to it's customers. The beauty of this platform, if they do this right, is the positive image the bank can portray to their customers, as well as those who are customers of other banking institutions, as they react timeously to queries, suggestions etc posted on the fan page wall . The public display of helpfulness is priceless PR. Of course, the opposite can also be true as they leave themselves open to public displays of unhappiness. It's going to be interesting to see how corporate South Africa use Facebook and it's online social media competitors to connect to their clients. Families face regular blackouts within three years because *** has not built enough new power stations, it has been claimed. Sound familiar? Replace *** with Britain. This story comes from Britain's Daily Mail Online. 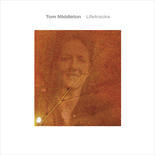 This is Tom Middleton's first, true solo outing and it's a stunner. He opens with the Crimson-inspired "Prana," driven by Fripp-like arpeggios that lead into a monumental beat and larger-than-life hooks. It's a heroic statement -- a pronouncement, an affirmation of life and a hope-filled herald for the rest of the recording. He even throws in some soaring string arrangements in the middle third of the piece, which adds to its majesty. "Beginning of the Middle" follows "Prana" and is no less epic, starting slow, acquiring electronic force, pulsing into a breathtaking escape that accelerates into a galactic-groove-overdrive. It's the type of music that I'd want cranking if I owned my own personal star craft, kicking it past the atmosphere of the familiar. Lifetracks is a big recording, elements of funk, jazz and space music manifesting in a positively bearable lightness of being. I started the Friday SA Music spotlight as a vehicle to share artists I have come across, most often on the web, that my readers may not yet know about. I hope to excite my readers as the discover talent on their doorstep that they have not yet experienced. And I am proud to say that most times I get feedback from new fans thanking me for the discovery and from the artist, appreciative of the extra exposure. However, I am acutely aware that many, many visitors are not South African residents. So very often, musicians that have become a household name here in sunny SA, have little exposure elsewhere in the world and there is space for my international readers to discover music we hear on our major radio station's playlists on a daily basis. 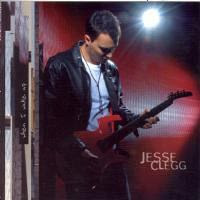 Hence, the spotlight has fallen on Watershed, Louise Carver, The Parlotones and now it falls on Jesse Clegg. To say he has burst onto the music scene is a bit of an understatement. Although he has been touring since 1988, it must be made clear that this was also the year of his birth, and the many performances he made on stage during his formative years were only enjoyed by a select few ... roadies. While having Johnny Clegg as a dad must have a massive influence on your musical career, there is no comparison's that can be made in style, something dad has made very clear. In fact in an interview he admits that the tracks his son presented to him, sounded great, but he had no idea how this would fit into a genre he new nothing about. Although, how cool must it be that you father goes and gets a second opinion from David Gresham! Jesse's breakthrough single 'Today' debuted back on mid August, and literally took the charts by storm, however amazingly people are still discovering Jesse, and perhaps to his credit, are unaware of his pedigree. The rest of his album, "When I Wake Up" has a much more rock vibe than 'Today', but are all very listenable, middle of the road, yet classy rock tracks. I have made a habit of making comparisons so, how about Just Jinjer? All is that just the voice? That's probably to South African to assist non-Saffa's anyways. So take a listen to the sample on his website and you make you own comparisons (and feel free to share in the comments). If I can just make one criticsm? 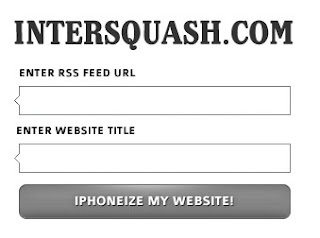 Jesse, if you ore one of your people read this, please do something about your website! This is a vital portal for your fans, current and potential. Please add some other samples in to the auto media player on your site. As good as 'Today' is, a repeated sample can make it wear extremely thin. The nice guys @ Google have decided that it's time that their Gmail interface gets a new look. However instead of shoving it down our throats, they are giving us a choice of around 30 skins, or themes, to choose from. While I have to say I haven't ever thought 'Gee, Gmail is looking old' the new look I chose, gave the whole Gmail experience a fresh feel. If you have a Gmail account click here to see the themes available. Perhaps it's my natural, in-bred aversion to the genre he is most associated with, but I keep finding myself re-discovering Chris Chameleon's music and being re-surprised (I don't think this is actually correct English, but it is the best description I could come up with) at the quality of musicianship and the depth of lyrics. 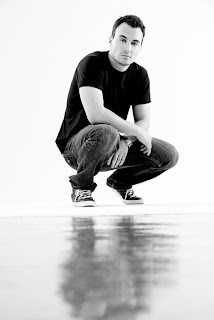 Chris started his journey in 1997 as the bassist and front man for Boo! which received as fair bit of international fame before they disbanded on 2004. 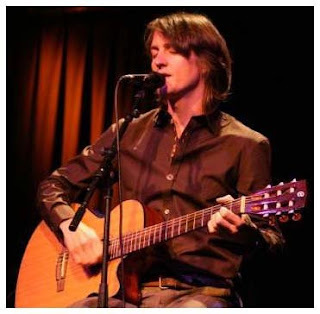 Although a prolific and successful Afrikaans singer/songwriter, his first English solo album 'Shine' was my first experience of his music and when my appreciation began to grow. A true ... er .. chameleon, his music cannot be forced into any genre. There is a a whole load of rock, folk and acoustic thrown into his songs but not necessarily into the same ones. For his latest single 'All of Me' he has released a video that is a collaborative Brighton based Shotopop and WIZZDesign in Paris who have created "emotionally charged visual journey set to a hauntingly beautiful vocal performance." It makes for awesome viewing while listening to yet another masterpiece. Check it out below. "All of me" by Chris Chameleon from Shotopop on Vimeo. Cape Town has experienced some severe wind conditions the past two days. We are used to the some South-Easters but when rain comes along with it, it is something a little unusual. Us locals call this the Black South-Easter. I found this bit of information on this local weather phenomenon @ 1stweather.com. "The Black South-Easter is a much misinterpreted phenomenon. It is refered to as a "BLACK" SE event when the SE wind is blowing, usually rather strongly, and it is raining at the same time. A Black SE usually is caused by a deep low pressure system over the SW Cape both in the upper air and on the surface and a very strong/intense SAH south of the country. The Laingsburg Floods and the Easter of 1994 are prime examples of Black South-easters in Cape Town. The tight pressure gradient between the systems cause the wind and the low pressure systems produce the rain. These Black SE events usually occur during spring and autumn, the months when the incidence of cut-off low pressure systems are high. " The pictures shown were taken by Lester Hein and there are many more pics on his blog "You are here." They are all taken at a notorius spot where the city's high rises create a tunnel-effect. This was so extreme today that the firemen were assisting people across the road. David Sheridan decided to place a camera on his kite-surfing sail to get some special pictures of himself on the water from 25m above his head. 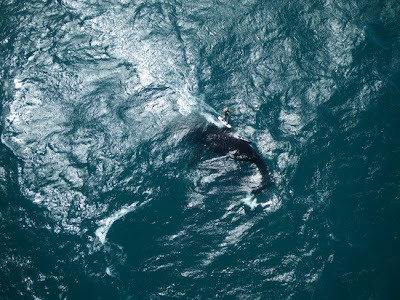 What he didn't bank on was getting this shot as he suddenly found himself on top of a Southern Right whale. Admittedly the 10sec delay between pictures meant he has no photographic evidence of the tail swipe he received just after this one has taken, but this one is special enough. This all happened off Valla Beach, on the north coast of New South Wales, Australia. There is a new free sms service that by all accounts actually is essentially free. Mjoy is using advertising within it's interface to support a service which allows it's users to send text messages of any size for free to any mobile phone in the world. Being a mobile web-based service they are also able to, and do, offer a few enhanced services like conversation-sorted messaging ala-Gmail for easy following of to-and-fro sms conversations, multi-source contacts import and mobile video. Registration is simple and quick and the experience not hard to follow, even without reading through the help, and the messages are delivered just as rapidly as normal messages would. The only difference being an additional 'I am texting for free with http://mjoy.com' after your message. Importantly when they receive the message it appears as if you sent it, so when they reply it goes straight back to your phone. For those who have 3G enabled phones with contracts with cost effective data plans this could change the way you communicate. Just remember this is not 'free' as you are paying your service provider for the data you view, but this is a whole lot cheaper than sending smses. Make sure you never miss a post @ Eish! !